PDM Healthcare is a leading national supply chain management company offering services to thousands of healthcare clients nationwide. PDM Healthcare is an innovative company well known for their innovations. PDM has negotiated group purchasing contracts with leading manufacturers for branded and generic pharmaceuticals, specialty/biotech and OTC products medical/surgical supplies, HME/DME equipment, wound care, nutritionals, diabetes care, office supplies, and technology products in order to offer our members a truly diversified portfolio of contracts to fully maximize savings. On average, PDM members save 10%-20% on their total annual spend. PDM Healthcare's Group Purchasing Division is dedicated to providing our members with the best quality products and technology at competitive (discounted) pricing. Compliant and committed members can achieve significant savings and unparalleled service for all of their business needs. We work with both consortiums and independent facilities nationwide to streamline operational efficiency, decrease overhead, manage purchasing budgets, and enhance revenue. The discounts we can provide to members is a direct result of the volume of purchases represented by our own member consortium, which amounts to over $7 billion in purchasing transactions per annum. 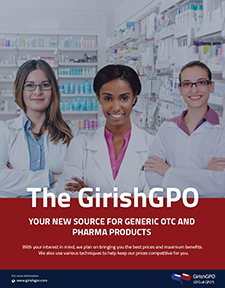 The Girish GPO is a national group purchasing organization affiliated with Glenview Pharma for the distribution of generic Rx and OTC products to the independent pharma segment. The major focus of our mission will be to bring competitive generic pricing, support programs, advertising, and special generic purchasing opportunities to our members. The Girish GPO and its affiliate, Glenview Pharma, are the culmination of founder Girish Ray�s more than 30 years of experience and his understanding of the generic drug distribution and manufacturing industry (Rx and OTC). As he navigated the industry, Girish came to realize that small, independent pharmacies are increasingly being taken advantage of by insurance companies, competitors, chains, and drug wholesalers. 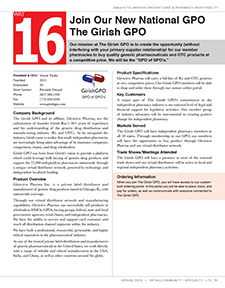 Girish GPO was born from Girish�s vision to provide a platform which could leverage bulk buying of generic drug products and support the 25,000 independent pharmacies nationwide through a unique virtual distributor network, powered by technology and independent localized investment. Glenview Pharma Inc. is a private label distributor of generic drug products based in Chicago, IL, with nationwide coverage. Through our virtual distributor network and manufacturing capabilities, Glenview Pharma can successfully sell products to wholesalers, HMOs, GPOs, buying groups, federal, state and local government agencies, retail chains, and independent pharmacies. We have the ability to service and support each customer and reach all distribution channel segments within the industry. We have built a professional, resourceful, personable and highly ethical reputation in the pharmaceutical industry. As one of the trusted private label distributors and manufacturers of generic pharmaceuticals in the United States, we work directly with a range of reliable and ethical manufacturers in the USA, India, China, as well as other countries around the globe. 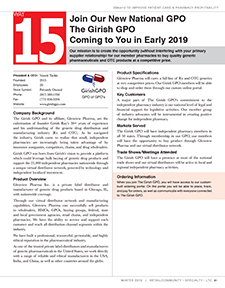 Virtual distributors will be your connection to The Girish GPO and Glenview Pharma. They are placed in strategic locations around the country to provide a local level of support for sales, order processing, customer service and GPO activities. They will be your local source of information about the generic Rx and OTC industry. Their mission is to help your pharmacy be as successful and profitable as possible. A large part of The Girish GPO�s commitment to the independent pharmacy industry, is our national level of legal and financial support for legislative activities. Our member group of industry advocates will be instrumental in creating positive change for independent pharmacy. 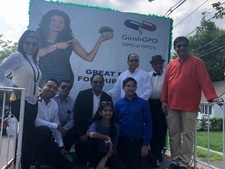 The Girish GPO in conjunction with Glenview Pharma, strongly believes in the importance of supporting our independent pharmacy community in their quest to improve patient health and wellbeing. It is our goal to provide high quality, low priced Rx generic and OTC products that will have a positive impact on our members and their patients. Excellence is not our goal� It is our habit. 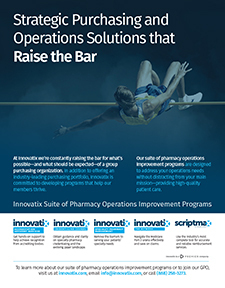 Innovatix is the nation�s leading non-acute care group purchasing organization. Since 1993, we have been committed to providing individualized purchasing, business, and supply chain solutions to more than 16,000 members in the U.S. and Puerto Rico. Our membership consists of infusion, specialty, long-term care, retail, combo shop, and mail order pharmacies; senior living facilities; behavioral healthcare facilities; independent oncologists; and K-12 schools. Innovatix offers one of the most extensive and competitive purchasing portfolios available today. Our relationship with Premier allows members to access some of the same discount pricing that was typically available only to the nation�s largest acute care institutions. In addition, we have negotiated exceptional pricing and advantageous purchasing terms directly with vendors and manufacturers in order to cater specifically to the markets we serve. We provide our members with access to a $36 billion purchasing portfolio that comprises over 1,700 contracts through 900-plus suppliers. Membership is FREE. Join today by visiting our website. Asembia is the nation�s leading group purchasing organization (GPO) for specialty pharmaceuticals. Asembia�s large and diverse membership includes specialty pharmacies, alternate care pharmacies, health systems and retail pharmacies serving a broad range of specialty patients requiring complex medication therapy management. GPO program offerings include; traditional up-front group discounts, rebates, fee-for-service agreements, data fees and other similar programs that help Asembia�s members and contracted manufacturers achieve their business and financial goals. Asembia is the gateway to the specialty pharmacy industry and first point of contact for pharma/biotech manufacturers and other vendors in this market. 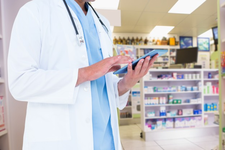 Asembia�s total channel management solution includes customized patient programs, prescription data management services, online platforms, and unique, cost-effective purchasing agreements for specialty pharmacy products as well as solutions for limited distribution products. Asembia is also the founder and host of the nation�s largest annual Specialty Pharmacy Summit (April 29 � May 2, 2019), welcoming thousands of attendees from pharmacy providers, pharma/biotech manufacturers, payers, drug wholesalers and more. 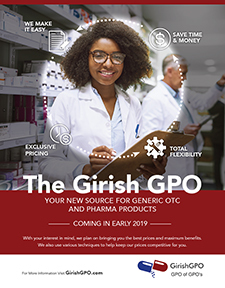 Our mission at The Girish GPO is to create the opportunity (without interfering with your primary supplier relationship) for our member pharmacies to buy quality generic pharmaceuticals and OTC products at a competitive price. We will be the "GPO of GPO's." 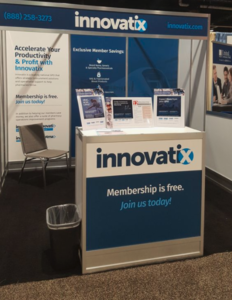 Innovatix offers differentiated, high-quality group purchasing and consultative services. We help members maximize their overall financial performance by providing the resources and educational support needed to enhance the delivery of quality patient care. Maximize Your Savings. Excel Rx can show you how. 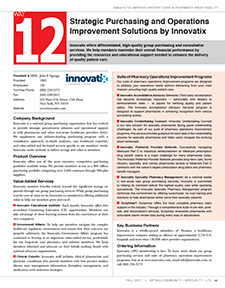 The next generation of specialty pharmacy solutions. 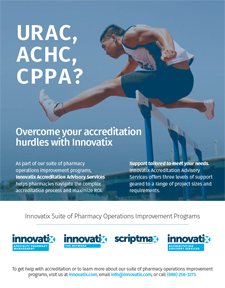 Overcome your accreditation hurdles with Innovatix. 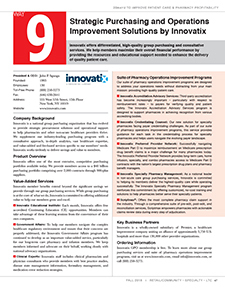 Innovatix is the nation�s largest Group Purchasing Organization (GPO) serving non-acute care providers. Through our affiliation with Premier, we are able to offer our members access to some of the most competitive pricing for a variety of products and services. 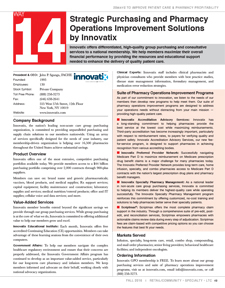 With over 14,000 members, Innovatix is the leader in providing purchasing solutions and operational efficiencies for long-term care (dispensing) pharmacies, retail and mail-order pharmacies, home infusion therapy providers, specialty pharmacies, senior living providers, independent oncologists, and physicians. Membership is free so join today! Premier's analytics, group purchasing contracts, and consulting services allow hospitals and healthcare providers to save hundreds of lives and billions of dollars annually. For more information, visit the Premier homepage above. West Warwick, RI 7.10.2011 - Building on its strength within pharmacy and healthcare, RXinsider begins a long-term, robust multimedia partnership with HIGPA and HISCI. As the nation's most influential supply chain event, RXinsider establishes a prominent presence at the 2011 International Expo in Washington, D.C., while affording many great exposure and lead-generation opportunities to HIGPA and HISCI across its numerous web-based and print properties. Both organizations anticipate significant growth targeting industry suppliers/manufacturers and GPO's. RXinsider Adds new Aisle to Virtual Trade Shows: "Reverse Expo"
RXinsider Adds new Aisle to Virtual Trade Shows: "Reverse Expo". West Warwick, RI 6.15.2011 - Building on its 116 existing Aisles in the Virtual Pharmacy and Virtual Healthcare IT Tradeshows, RXinsider has added a new "sub aisle" dedicated exclusively to "Reverse Expos" in thealthcare. 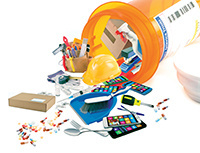 Focus of the new aisle includes Pharmacy, Healthcare IT, Radiology & Imaging, Hospital O.R. & Surgery and Group Purchasing and will serve to educate healthcare professionals on leading reverse expo providers.